There are two types of Fathers…those who work on their own vehicles and those who don’t. 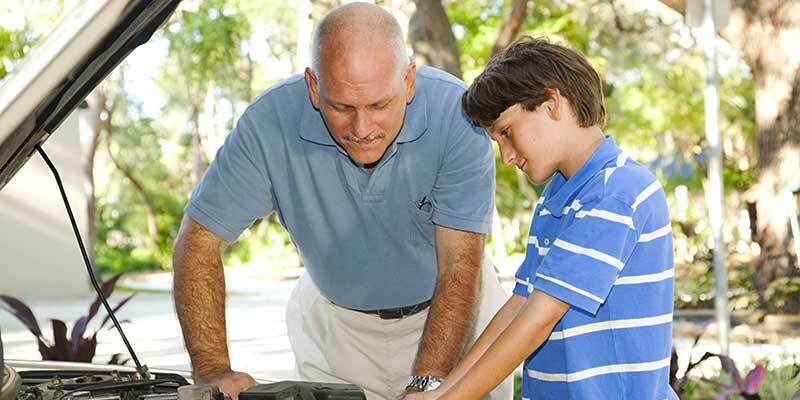 Whether your dad is a do-it-yourself-er or a do-it-for-me-er type, consider an automotive gift for Dad this Father’s Day. According to the Car Care Council, studies show that 69% of male drivers work on their car, truck, mini van or SUV. Whether it’s light maintenance, like changing the oil and replacing the wiper blades, or even heavier projects like replacing brakes, most Dads enjoy taking care of their own vehicles. Therefore, automotive accessories, tools, parts, and products make ideal Father’s Day gifts. If Dad’s a do-it-yourselfer, a gift certificate from the local auto parts store would be appropriate. If he’s a do-it-for-me-er, think about a Car Care Clinic gift certificate for service. Everyone loves a clean car, so offer to clean and polish Dad’s vehicle yourself. Remember to use automotive washes and waxes, not dishwashing detergent from under the kitchen sink which can harm the vehicle’s finish.